Brochures can be used to let people know about your small groups and different ministries you offer at your church. Choose from our multiple paper stocks and folding options to create an effective communication tool for your church. Rated 5 out of 5 by Elijah from Excellent quality and customer service My design wasn't print ready as I thought. Their staff helped me with improving the design and they printed it very well. Rated 2 out of 5 by Phil from Promo Brochure Not happy with the quality the folded edges lost their color. Poor quality over all. 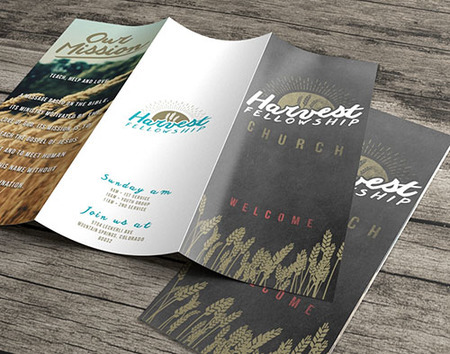 Create high quality brochures for your church with a variety of paper stock, size and folding options. You can get an instant quote with our online quote tool, upload your artwork and view your automatic proof on your schedule. PrintPlace makes it easy and affordable. Choose from 5 folding options and multiple sizes to create a brochure that fits your church’s communications needs. In a hurry? All church brochures are available with our same day printing turnaround service for orders sent to press by noon CT. Need layout help? Choose one of the layout templates below. You will find the right layout template for your project no matter what fold or size you use. Even if you’re a pro at graphic design, it’s a good idea to use these layout templates, so you can check your dimensions and ensure your brochures print correctly on our presses. Simply download the appropriate file from the list below. Save time and money by letting us take care of mailing your brochures. Our mailing services option for brochures includes processing the list, duplication removal if requested, CASS address certification, inkjet addressing and postal presorting for automation rates. The cost for mailing brochures is $24 per 1,000 plus an $85 setup fee (plus postage). The post office requires brochures to be tabbed when mailing, so be sure to select tabbing when you are ordering your church brochures. For details about mailing requirements such as size and tabbing specifications, read our Brochure Mailing Requirements. A brochure can give a lot of information without overwhelming the reader, because they provide it in an organized and compact format. This makes it an ideal way to showcase your business. Tell the story of your company – Give more than just your name and slogan. Tell the story of how you started and why you are here. Showing the personal side of your business will make your customers feel welcome because they already know you. Explain a popular service – Show how a particular service can be useful to your customer by giving them specific examples. Illustrate how your product works – When a photo isn’t enough, more room for a product demonstration can come in handy. Detail an upcoming event – Include a schedule and full details of an upcoming event so anyone interested will hold onto your brochure for the information.